Nine years ago, I celebrated my 16th birthday with my family at my favorite restaurant not far from my home in Connecticut. The conversation was light and happy. At 16, some live while others have lived . That is not to say that some young lives are insignificant but rather to emphasize that for many, to ‘live’ at 16 is to exist in the microsystem constructed by our families. We often lack the experience and knowledge to exist independently, through no fault of our own and thus, a life is created for us by our families as it has been for hundreds of thousands of years. We live in the context of that life and develop an identity and idea about the world based on what we see, what we know and what we feel. At 16, some of us know only what we are given- but some of us know more. At 16, I was four years recovered from an eating disorder that nearly killed me. I had already lived one life and was given the chance to live another. I vowed to do something, anything that would help girls and women understand their worth. Today, another girl turns 16. Malala Yousafzai, a Pakistani education activist and reformer, was shot in the head by the Taliban on October 9, 2012 on her way home from school. At the time, I found the depth of her reality and circumstance incomprehensible. I was distraught for her and I was angry that education, a basic human right that we all deserve, can be an unsafe venture. Today, on her 16th birthday, Malala addressed the United Nations Youth Assembly as Secretary General Ban Ki-Moon and the U.N. special envoy for global education, Gordon Brown, called on world leaders to make education safe and accessible. The United Nations has declared July 12th to be “Malala Day.” As she spoke, Malala was humble and stated, “Today is not only Malala Day. Today is the day of every woman, every girl and every boy who have raised their voice for their rights.” She called upon girls and women to fight for their rights and to be courageous in that journey to recognizing their full potential. Part of that journey is to make education safe and accessible for everyone. A deeply disturbing void exists- 57 million children worldwide, most of them girls, are not in school. This disproportionate representation is bound to the oppression girls and women experience in many parts of the world. 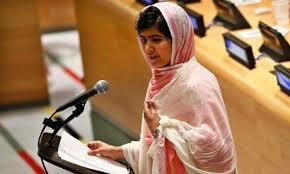 The speakers at today’s Youth Assembly, including Malala, emphasized the power of knowledge in the face of evil. “The extremists are afraid of books and pens. The power of education frightens them,” she says. Malala is right- to deny education is to perpetuate the cycle of inequality and oppression. Today, Malala marks a milestone she was not always expected to reach as extremists vowed death upon a girl who wants to change the world. Today, as Malala turns 16, let us praise her bravery, courage and a life that transcends its years of existence. She has been given a second chance- that is certainly something worth celebrating.